Small - $53.99 Only 1 left! Medium - $53.99 Large - $53.99 Only 7 left! When you see some of those superheroes zip around on the silver screen, you might be fooled into thinking that being a hero is all about super powers. After all, Wonder Woman can bench press a semi-truck. Superman can fly through the air like some kind of fighter jet. Cyborg can control computers with his mind and shoot giant blasts of energy out of his hands. And Aquaman? He can swim faster than a speed boat, making him the most dangerous thing in the seas. What about Batman though? Batman doesn’t need any silly powers! He’s got smarts and sometimes that’s all you need to be a superhero. Well, that and a pretty impressive bank roll! Batman uses his wits to take down bad guys, so you better tell your child to start studying if he wants to wear this Justice League Batman costume! That’s right! 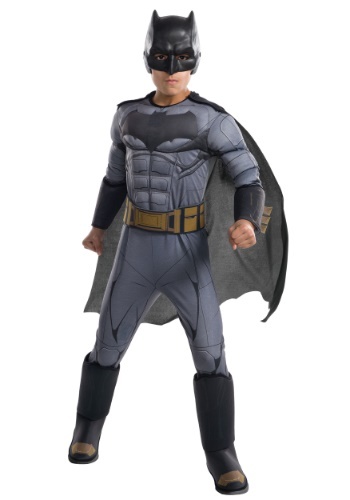 Your child can transform into the crime fighting hero, Batman, with this deluxe costume from the movie. It comes with a full jumpsuit that has printed details and muscle padding in the chest to give your kid the look of a real comic book hero. It also comes with the attached cape and a mask to help him hide his secret identity from any bad guys who cross his path. But if he really wants to be a hero, he’d better be honing his smarts, since Wonder Woman and Aquaman will be counting on your little one to come up with the plan that takes down the bad guys!